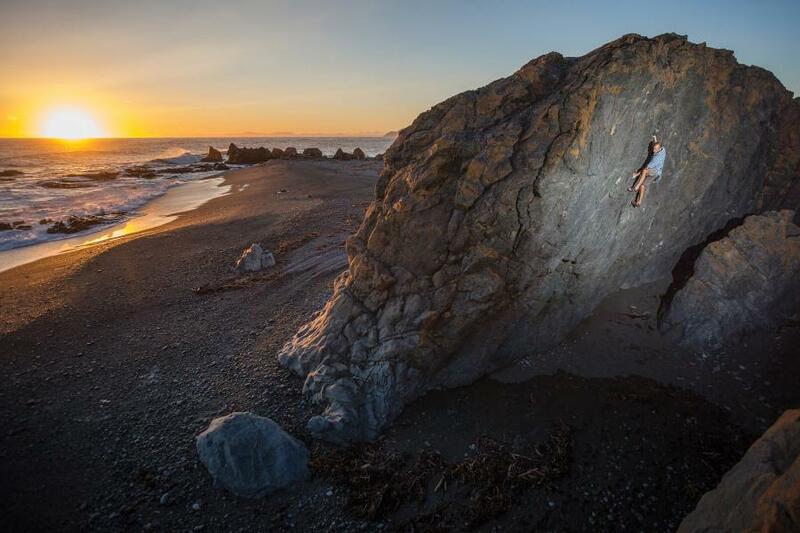 On a rugged beach, squeezed between the southern tip of the North Island and the often wild Cook Strait, Baring Head was the birthplace of bouldering in New Zealand. It has been a forging ground for some of New Zealand’s best climbers. The greywacke rock is slick and crimpy. Many proud and intimidating boulder problems rise up to eight metres above coarse sandy landings. The best that Baring Head has to offer is bouldering from a bygone era, where poise and composure, rather than difficulty, is paramount. Perhaps the best of best is the Dirty Dozen circuit of V1 to V4 routes on the Overhanging and Only the Good Die Young Walls. But those seeking pure physical challenges will not be disappointed, with iconic test pieces such as A Show Of Strength (V8) and Check Your Head (V10), as well as enormous potential for hard eliminate problems. If sport climbing is more your cup of tea, the nearby Ship Rock offers half a dozen surprisingly enjoyable clip-ups. Baring Head is a part of the East Harbour Regional Park, administered by the Greater Wellington Regional Council. From Wellington by car, drive to Wainuiomata and follow the main road south until you reach the Coast Road. The road takes you to the south coast, which takes about 15 minutes, and a carpark with direct access to the beach. Walk west along the beach to the rocks. The walk nearly always involves crossing the Wainuiomata River. If the sea is relatively calm, cross at the river mouth. If there is a big sea running, cross closer to the carpark. Take care. It is possible to get to Baring Head on a bike. Either catch a bus to Eastbourne or ferry to Days Bay. Cycle south around the coast until you come to Baring Head (about an hour from Days Bay). Save some energy for the ride back.